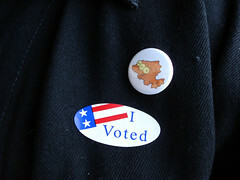 I voted because I could. I voted because I wanted to. I vote because I think it matters. I vote because I care. I vote because I think the health care system is broken. 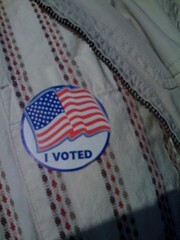 I vote because money is getting misspent. I vote because the taxes on small businesses are too heavy. I vote because I want the earth to be saved. I voted to protect my friends who married someone that loved them back. I vote for those who have no voices because they are not citizens. 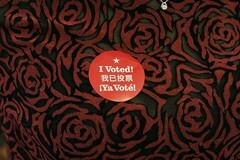 I vote because I am an immigrant. I vote for our future and for what I want the world to be. I voted first thing this morning. all great reasons! good for you, cindi! nice reasons cindy li. did you notice my name’s cindy li, too? I voted McCain * Palin because I really care about America! Obama is just a rock star, nothing more and nothing lest.